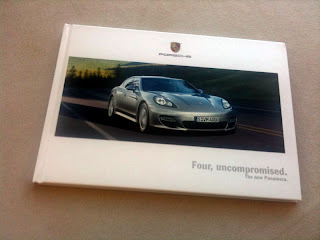 A 46-page, eight-color bounded book for the Porsche Panamera showed up in my mailbox at work yesterday. I get a lot of mail from other automakers as I sign up for all communications on every website I visit. This gives me an excellent opportunity to see how brands market their vehicles on email and snail mail. I have received posters, CDs, and DVDs, but mostly a lot of postcards and brochures. Few mailers really are worth mentioning which is why this is the first mail piece I have covered on this blog. Porsche is really pushing the Panamera to its hand-raisers. Porsche has plans to make 20,000 units globally with 6,000 units to be sold in the U.S. To date, Automotive News has no data showing any sales of the Panamera in the September 2009 US Nameplate Car Sales report. That leaves a lot of product to sell in a very tough economy at time when luxury buyers are moving down market with their luxury car purchases. The engine page uses spot-varnishing and there is even some relief in a printed page made to look like the image is taped to the book. It’s all a very elaborate and impressive execution, especially when you consider all I did was complete an online form to stay updated about the car. I never visited a dealership and from what I can tell no one at Porsche verified my income or credit worthiness; though, this would have prevented me from receiving this lovely bound book. 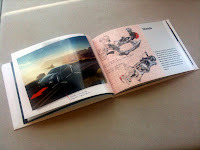 I have to say looking through the book that I did develop a very positive opinion of the car. Every aspect of the vehicle is covered with photography that is quite impressive. Vehicle angles are good and the luxury and sporty attributes are effectively communicated through diagrams, charts and cutaways that intrigue the senses. Plus there is a positive brand image that is communicated when you receive such an impressive piece of mail – you matter. Yes, you that person who isn’t even a customer yet. You matter to Porsche. It’s like the early days of dating someone who just did all the right little things to make it amazing. The right words. The right expressions. The right touch. You wonder what will come next, how will the relationship evolve. 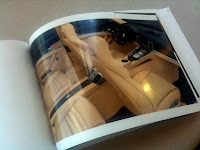 In the meantime, I’ll enjoy my Panamera book and keep on the lookout for the next item to entice me to buy a Panamera. This better not be the last communication, because I’ll need a lot… a lot… of enticing, but I am impressed and waiting by my phone and checking my mailbox. You know, from a PR perspective, Porsche is VERY German in North America. They're rigid stalwarts of old media, mainly because their primary demographic is the 40+ market, which still hasn't really taken hold of social media in a large way. I'm a little envious of this package that you received, because I l.o.v.e. the Panamera, and at the end of the day...who isn't a glutton for something tangible that you can stick on your desk somewhere?